Waukesha-Oconomowoc Area Book - Vintage - Original Fishing Hot Spots Book by Bob Knops and Steve Brich. Seventh Printing 1990. Limited Quantities Available. Author original collection. Some books may have minor shelf wear on the covers, some are still sealed in original shrink wrap. 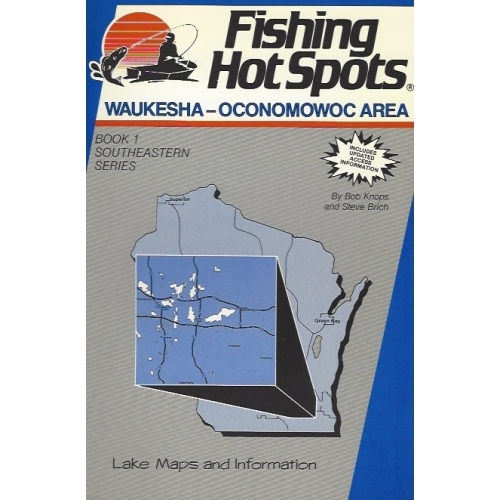 Ashippun, Beaver, Crooked, Dutchman, Etter, Florence, Forest, Fowler, arvin, Golden, Henrietta, Hunters, Keesus, Lac La Belle, Lannon Park Pond, Linnie Lac, Lower Genesee, Lower Nashotah, Lower Nemahbin, Middle Genesee, Moose, Nagawika, North Lake, Oconomowoc, Okauchee, Ottawa, Paradise Spring, Peewaukee, Pine, Pretty, Reagons, Saylesville Lake Mill Pond, School Section, Silver, Upper Genesee/Otis, Upper Nashotah, Upper Nemahbin, Upper Oconomowoc, Utica. These books have been discontinued and are only available while the quantities last.